Resistance bands are fantastic tools for stretching your shoulders as well as making them stronger. The following content will consists of exercises that can be completed in the gym or at home. Each of these exercises requires the individual to progress through each movement as instructed and then return the resistance band back to the starting position in a controlled manner. This action will prevent the band from snapping back due to the created tension and potentially causing harm. Be mindful of your resistance band selection and choose one that is appropriate for the exercise and your strength level. The shoulder press is a fundamental exercise for strengthening your shoulder. This workout is commonly completed with a pair of dumbbells or a barbell, but can also be done with a resistance band. The resistance band provides a tension throughout the motion that works the stabilizers muscles in your upper body differently than with the dumbbells. In addition to working out the muscles in your shoulder region, the reverse fly also strengthens your back. 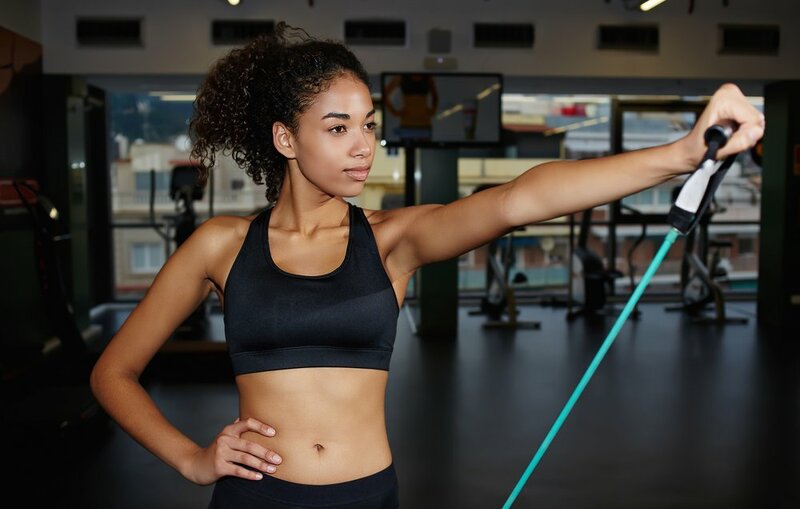 For this exercise, have both arms fully extended in front of you, grab the ends of the resistance band and placed your hands shoulder width apart. To complete one repetition, move your hands between this starting position to the position indicated in the picture and then return it back to the starting point. The overhead pull is similar to the standing reverse fly. Simply hold the resistance band above your head with your arms fully extended and shoulder width apart. Move your hands back and forth in a controlled manner between the starting position and 45 degrees, as shown in the picture. If this range of movement is comfortable to you, try to see if you can stretch the band and move your hand from the starting position to 90 degrees from it. The backward raise will build up your posterior deltoid muscles. Move yourself into a squat position to maintain your balance throughout the workout. With your feet placed on the resistance band and your hand holding its ends, begin by placing your hand by your knee and shoulder width apart. Next, pull the resistance band’s ends as far back as possible before restoring your arm back to its original placement. The picture shows an example of the exercise’s end position. Use the lateral raise exercise to enhance your deltoid’s lateral region. Place both feet on the middle section of the resistance band. In a bent posture, stabilize your body and relax your hands by your side. Grabbing hold of the resistance band’s ends, lift your hand laterally to shoulder height and return to the starting position. Your palms should be facing parallel to the ground at the peak position. This front raise exercise will fortify the muscles fibers in the anterior region of your deltoids. You can position your feet to be parallel to each other or in a staggered position. In this scenario, the individual is choosing the former option with the resistance band placed under her feet. Your hands should grab the ends of the band while positioning the thumbs toward the ceiling. Start with your hands laying by your sides and then raise your hands up to shoulder height. Bring your hands back to your sides to complete a repetition. This exercise is an alternative option to the front raise. You should utilize the same movement as the front raise with the exception of lifting the resistance band with one arm at a time. The one-arm shoulder raise helps prevent imbalances in your shoulder strength. In addition, it is great to target a shoulder that is recovering from a shoulder injury and build back its strength. Find a elevated platform to anchor or wrap the resistance band around. Find a standing position that is comfortable and allows you to stabilize your body through the exercise, such as a staggered stance or a squatted position. 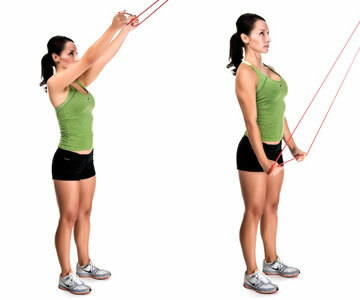 Start with your arm extended and your hands holding on to the resistance band like the first image. Keep your arm locked out as you pull the resistance band from above shoulder height to below your waist. This exercise will work your shoulder mobility and upper back. Add this workout to your routine if you want to improve your trapezius muscles as well as the deltoid muscles in your shoulders. Simply stand on the resistance band with both feet positioned shoulder width apart. Start with your arms extended and grabbing the ends of the resistance band. Next, pull the band up to chest height as shown in the image and return the band back to the beginning. This is a great workout for stretching and increasing mobility in your shoulder. Grab one end of the resistance band and place that hand by your hip bone. The other hand should be positioning the opposite end of the band at the middle of your chest. Have your arm extended and locked out as you move the band from the starting position to the placement seen in the image. Afterward, return back to the beginning position. As demonstrated, one shoulder stretching routine consists of using the resistance band to help your behind the back stretches. This method is extremely effective when an individual cannot reach the fingertips of the opposite hand to stretch behind their back. Use this method to slowly stretch your shoulder to a range as far as you can, but without pushing yourself pass the threshold and causing any damage to your own shoulder. If you don’t have resistance bands, here is the one I suggest above. I used it with great effect to rehab my shoulder after surgery and still use it to work out my shoulders. The great thing about these resistance bands is that they come with everything you need to progress in weight and exercises.